Year by year, her ambitions grew. Games could not only increase happiness, they could become collaborative problem-solving tools. Abandoning the defined narrative of her earlier ARGs, McGonigal tried in 2007, with modest success, to empower ARG players to create the narrative collectively. As "Participation Architect" in Ken Eklund's World Without Oil - blogging as mpathytest - she led what amounted to a 1,700-person Peak Oil brainstorming session. Superstruct, her 2008 forecasting ARG, presented real-world data and asked 8,000 players to solve future crises like plagues, shortages and refugee swarms. Given their small turnouts, both these experiments held interest primarily as publicity exercises - and, theoretically, as "experience grenades," McGonigal's term for games that benefit players through later reflection. But 2008's The Lost Ring, her Olympics tie-in about a forgotten sport, revived her early Go-Game/flashmob theme of physical participation in performance art. The six-month project drew hundreds of thousands of players on six continents. Meanwhile, McGonigal's SXSW Interactive keynote (slides, liveblog) marked her most audacious performance yet. She started with a question: "Why aren't we making games that alleviate suffering?" Games, she said, "give us responsibility and powers. Skills and ideas you develop in game worlds can solve real-world problems." Games provide a ready-made "engagement economy:"
This engagement economy would make massively multiplayer collaboration "the most important human ability." And "the great work of game designers" - as she told a breathless audience of them at the March 2009 Game Developers Conference in San Jose - is "to re-invent real life as we know it." Jane McGonigal had arrived at her reasoning's logical culmination: If gameplay teaches real-world empowerment, then, consequently, gamers can exert power. Reality is broken. It falls to gamers to fix it. With her growing fame and authority, increasing technical skill and powerful allies, she seemed poised to help change the world. Then she hit her head. McGonigal called her recovery game, SuperBetter, an ARG: "An alternate reality game can be as simple as a good idea, a fresh way of looking at a problem." Taking a heroic identity, Jane the Concussion Slayer, she embarked on a "superhero to-do list" of goals, "trying to level up in things that are going to help me recover" (1. Satisfying work to do). She identified bad-guy symptom triggers, power-ups and productive tasks that didn't strain her, like baking cookies (2. The experience of being good at something). She recruited her husband and twin sister as allies who bestowed "achievements" for her SuperBetter accomplishments (3. Time spent with people we like). Within days, her mood lightened and her motivation improved. In five weeks, she recovered completely. Does this confirm McGonigal's belief in the empowering "engagement economy" of gameplay? "I can't say for sure that I got better any faster than I would have without playing the game - although I suspect it helped a great deal," she wrote on her blog, Avant Game. 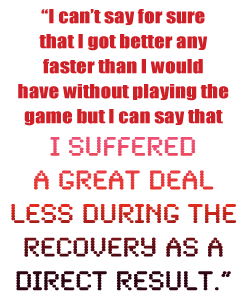 "But I can say for sure that I suffered a great deal less during the recovery as a direct result [...] [W]hen the tough reality we have to face is that getting better won't be easy, a good game can better prepare ourselves to deal with that reality." As for (4. The chance to be part of something bigger) - that lay ahead.